i was in favorite blog stalker lena's wedding to mr. elliot hunt 2 months and one day ago. 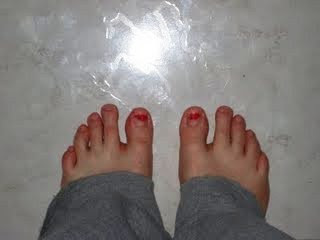 i painted (all of) my toenails red that day. look how far their marriage has come. happy first 2 months! and here's to many, many, more months and years together to come, symbolically marked by inches and yards of my toenails growing out and being neglected. p.s. marisa, i wish you were here so i could put these feet on your face and you could get super freaked out because of your podaphobia. *jazz hands* monorail! hahaha mine are still red too. I'm ashamed. And I still hate feet. Do something about those girl!